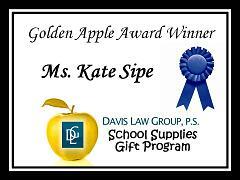 The personal injury lawyers at Davis Law Group, P.S., a Seattle law firm, is pleased to announce that Kate Sipe is a recipient of the Davis Law Group School Supplies Gift Program. Ms. Sipe is a 3rd and 4th grade teacher at Seattle's Green Lake Elementary School. Ms. Sipe was nominated by Marleen Arenivar who is the proud parent of a Green Lake student. Arenivar describes Ms. Sipe as an extraordinary teacher who believes in every single one of her students. She thinks that Sipe spends hundreds of dollars of her own money each year on books as well as reading and math materials.